SEOUL, South Korea (AP) — Day after day, rampant speculation about North Korean leader Kim Jong Un’s possible trip to Seoul is making headlines in South Korea, despite no official confirmation from either government. Many analysts say it would be extremely difficult for Kim to fulfill by the end of this year his reported promise to become the first North Korean leader to visit South Korea, given limited time for preparation and impasses in global diplomacy on his nuclear weapons. But others say we will not know until the year is over, noting that several previously unthinkable events have happened in the past months, including Kim’s June summit with President Donald Trump in Singapore. As the year draws to a close, South Korean media, experts and politicians are churning out reports and guesswork on whether Kim will come to Seoul by the end of December, or will postpone or even spike his plan. South Korean President Moon Jae-in appears to be pushing Kim to keep his promise, though he said there is no time frame for his visit. After a meeting with Trump last week on the sidelines of the G-20 summit in Argentina, Moon told reporters that the two agreed that Kim’s trip would play a “very positive role” in U.S.-North Korea nuclear diplomacy. Moon suggested that Trump agreed Kim’s Seoul trip could come before the resumption of high-level U.S.-North Korean talks, including a possible second Trump-Kim summit. One of the time frames that South Korean media say would likely be for Kim’s trip to South Korea is Dec. 18-20. These dates are based on a belief that the two Koreas would need more than a week of preparation, and would allow Kim to stay at home for a Dec. 17 memorial service for his late dictator father, Kim Jong Il. Also, Kim would be busy in late December preparing for his annual New Year’s Day address to outline his policy directions for 2019. South Korea’s presidential Blue House, however, has denied that time frame. The Blue House reiterated Wednesday that Kim’s trip can occur either this month or early next year, saying it’s up to North Korea. So the ball is in Kim’s court now, but his propaganda services have been silent about a Seoul trip. Kim might find such a trip less beneficial now than when he agreed to it following his third summit with Moon in Pyongyang in September. At the time, some experts said the United States could soon accept a North Korean request for jointly declaring the end of the 1950-53 Korean War as part of security assurances to the North so that Kim could find it less burdensome to make a symbolic, emotionally charged trip to Seoul after receiving that political concession. But North Korea-U.S. diplomacy has since come to a standstill amid disputes over a U.S. demand that North Korea first disclose a full inventory of its nuclear weapons and take other significant denuclearization steps before winning major outside rewards. North Korea, for its part, now wants sanctions relief, the end-of-war declaration and other reciprocal measures from the United States, arguing it has taken some steps, like dismantling its nuclear testing facility and releasing American detainees. Kim’s top lieutenants could also persuade him not to go to Seoul, citing worries about security arrangements for their “supreme leader” visiting an enemy state. It’s almost certain that Kim’s trip would trigger huge daily protests in Seoul by activists, conservative politicians and North Korean defectors. South Korea’s main conservative opposition says Kim must first apologize for 2010 attacks blamed on the North that killed 50 South Koreans before stepping on South Korean soil. No North Korean leader has traveled to South Korea since the end of the Korean War, which killed millions. There have been five summit talks between the leaders of the Koreas, three of them between Kim and Moon, but they all happened either in Pyongyang or the inter-Korean border village of Panmunjom. When Kim’s influential sister, Kim Yo Jong, and favorite pop diva, Hyon Song Wol, came to South Korea earlier this year at the start of his outreach to the South, their trips triggered a media frenzy here, with TV cameras and photographers following their every move. A Kim trip to Seoul would surely garner even more worldwide attention. Seoul is the bustling capital of a country that Kim until last year repeatedly vowed to destroy with his nuclear weapons, and which his dictator father and grandfather wanted to unify with the North. Moon would likely arrange many emotional events, such as jointly visiting South Korea’s highest peak, Halla Mountain, like they did to the North’s sacred Paektu Mountain during their Pyongyang summit. Kim also might address South Korea’s parliament, after Moon addressed a Pyongyang stadium packed with 150,000 people at the September summit. 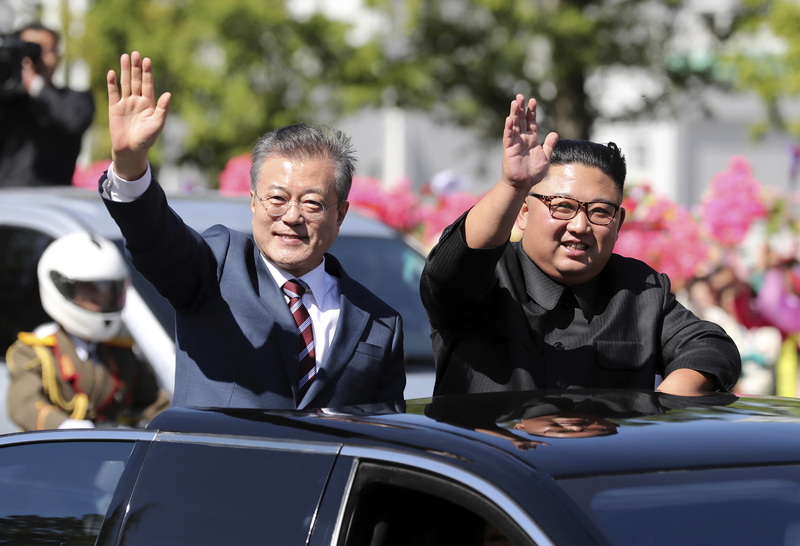 Moon said Kim’s trip would be “unprecedented” and contain a message of his commitment to nuclear disarmament, improvement in inter-Korean relations and world peace. Kim’s father, Kim Jong Il, vowed to visit South Korea at an “appropriate time” after his 2000 summit with then-South Korean President Kim Dae-jung. But he did not carry out his promise before he died in late 2011, handing over power to Kim Jong Un, his youngest son.